During the test, the teacher can monitor the students’ progress and pause/view the test. - The remaining time is displayed. 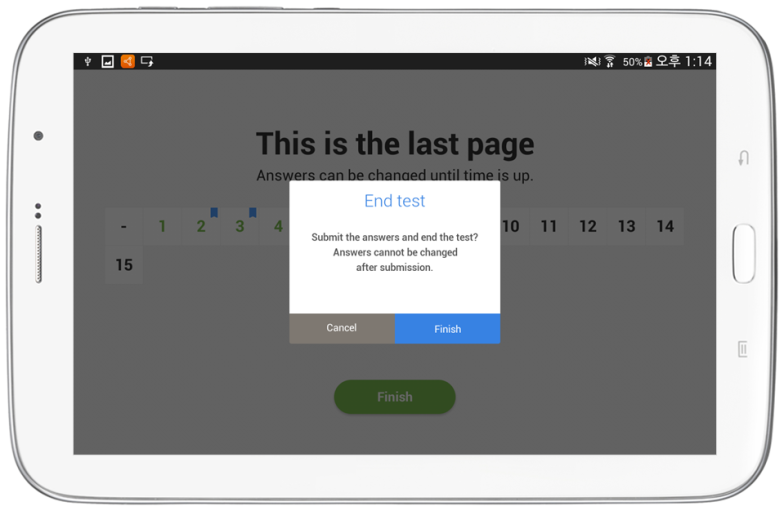 - If selected, all students’ screen will be locked, the test will be paused, and the remaining time will blink. - When paused, a “resume” button is displayed and you can resume the test by selecting it. 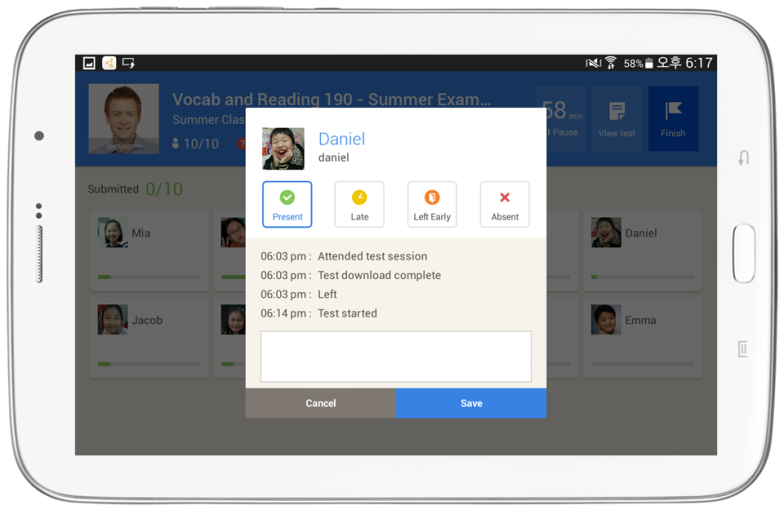 - In this mode, the teacher can view the test while the students are taking it. - Since, dual screen is active, the remaining time will be displayed on the connected screen. 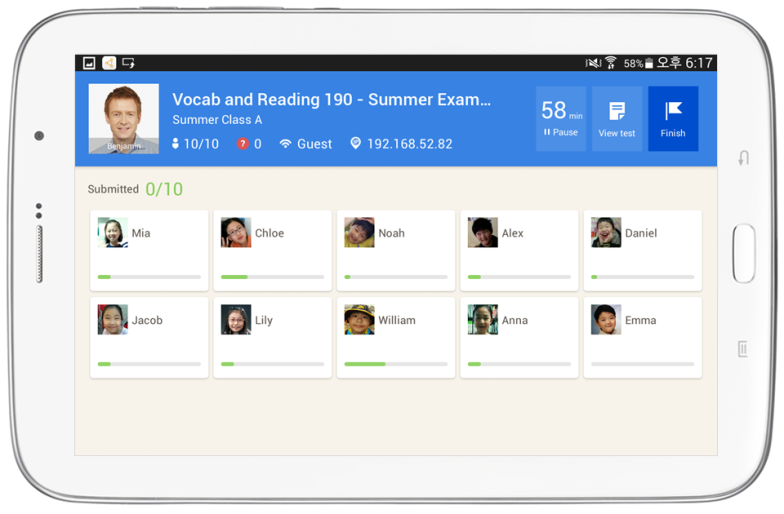 - A graph showing total answered / total questions is displayed on each student’s profile. - When a student’s profile card is selected, a pop-up displaying their events will appear. - Attendance during the test: A request to enter the session during the test time. - Logout: Students that logged out during the test. - Disconnected: Students who were disconnected due to the network. - Left the test: When another app is opened during the test. - Submit: When students have submitted during or after the test. - Displayed on the top of the screen. - Answered questions are displayed in color and bookmarked questions are also shown. - The time is displayed. - You can adjust the test font size. - You can bookmark important questions or ones you want to re-check. - After completing the test, select the Finish button to submit the results to the teacher. - When the results are submitted, the test will end and the responses cannot be edited. The teacher’s student list will display submission complete. - If there is an error, you will be moved to the “My Test” page and the test can be submitted through the Cloud.